Even though it held a 1-seed, I think Doug was actually the underdog in this matchup. On paper, Hey Arnold! is a better a show. It does everything across the board that Doug does, but x11. Where Doug excels though, is in the nostalgia department, which most likely elevates it against whatever show it goes up against. I think that’s what made this competition so interesting. The nostalgia factor. We had to measure our matchups in two different timelines, what the shows meant to us then and how we frame them now. I mean, we could probably scramble the whole bracket again, run it through, and go on to get an entirely different Final Four; let alone a new champion. 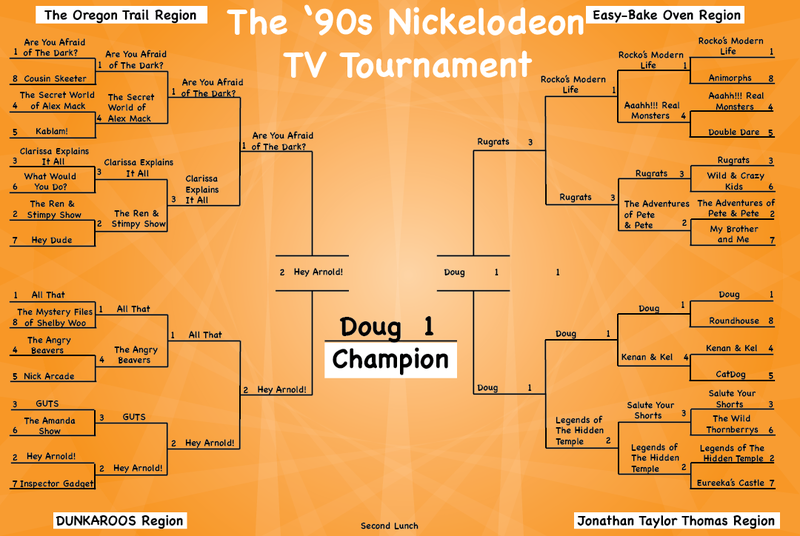 I’ll tell you right now that Doug is my favorite Nickelodeon show of all time, but when I filled out my own bracket, I didn’t even have it in the Final Four (I had Hey Arnold! winning it all), so I’m pretty excited that it won. Sometimes I wonder what I liked so much about Doug. Was it his average sensibilities? Porkchop? Pining for Patty? Quailman?! There were so many things to love about that show that it’s hard to pick one that stands out. But I think that the best aspect for me, was Doug’s imagination. It was that way he’d always just get lost in his own head, the way he could daydream with reckless abandon. That spoke to me, more than anything. I was 10 years old when Doug debuted. And at the time, it wasn’t uncommon to find me with a cape around my neck dreaming about being the hero too.